Former Air Transport Auxiliary pilot Jaye Edwards alongside the Vintage Wings of Canada Spitfire. As a child, Stella Joyce (Petersen) Edwards was always pushing boundaries. She grew up in Kent, England, the third daughter of an Australian trader, and whether it was scaling walls, climbing trees or riding her bicycle off into the countryside, Jaye, as she became known to her compatriots, was an adventurer. 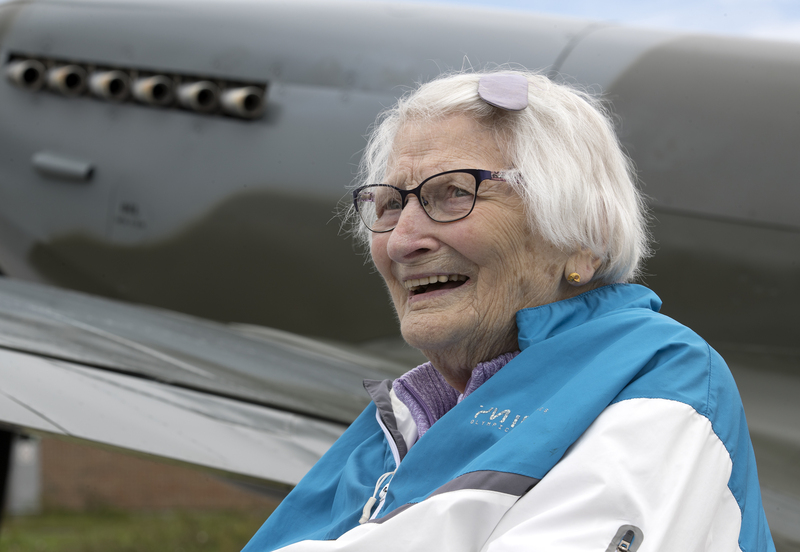 “I think I was always a bit wild,” admits Edwards, now a century-old resident of Vancouver and one of three surviving women pilots of the Air Transport Auxiliary (ATA). It was during one of those bicycle rides that she encountered a barnstormer in a field near her home and the first seeds of the aviation bug were planted. She remembers watching her mother—who had earned a science degree from Oxford University in 1907—board a biplane and take off for Paris. She was captivated by the romance and adventure of it all. And she recalls the indelible impressions left by a series of record-breaking solo flights by Kiwi aviatrix Jean Batten, including England to Australia in 1934 and England to her native New Zealand in 1936. At 21, Edwards joined the National Air Women’s Reserve, a small flight school which met on Sundays. She earned her pilot’s licence flying a Tiger Moth just like Batten’s. Women were banned from flying in the Royal Air Force at the time, so Edwards spent the early years of the war working in childcare, then as a nurse. Aviators, however, were in demand, and not just for war-fighting. The British government created the civilian ATA, made up largely of pilots deemed either too old or not physically fit enough for active military service. Physical handicaps were ignored if the pilot could do the job, and there was no shortage of them in what was nicknamed the Ancient and Tattered Airmen, including one-armed, one-legged, short-sighted and one-eyed flyers. 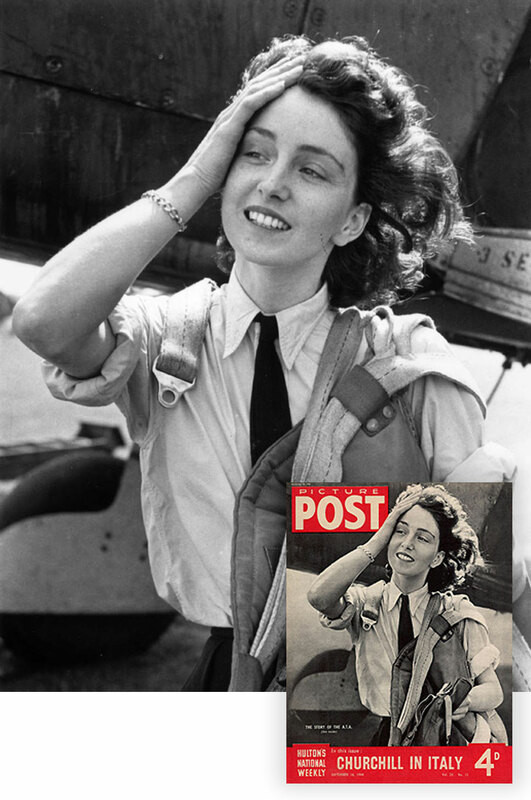 First Officer Maureen Dunlop of the Air Transport Auxiliary, on Sept. 16, 1944. They were initially employed to transport mail and supplies for the British military, but their duties soon encompassed ferrying military aircraft in various states of airworthiness between factories, assembly plants, repair depots, maintenance units, scrapyards and combat squadrons. Despite the air force prohibitions, it was not long before a lone, determined woman launched an effort to break down the barriers blocking female pilots from the ATA. 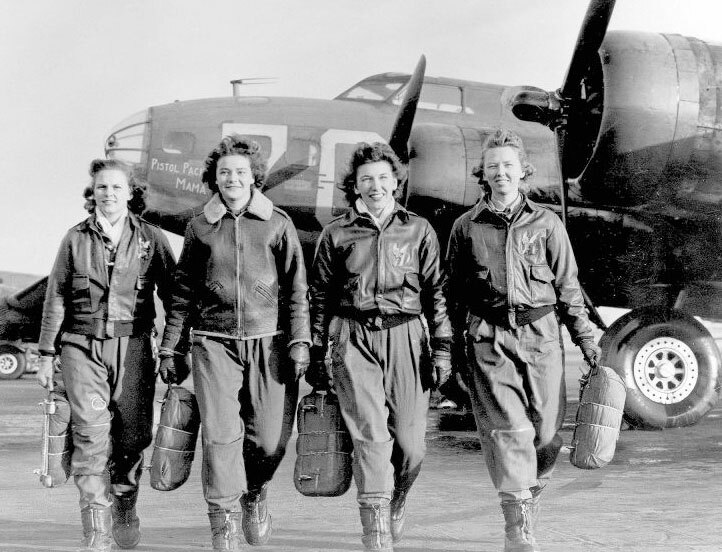 While female ATA pilots would soon receive equal pay to that of their male colleagues, U.S. Women Airforce Service Pilots (WASPs, pictured) received as little as 65 per cent of the pay given their male colleagues. These pilots are leaving their ship at the four-engine school at Lockbourne, Ohio, where they were training on the B-17 Flying Fortress. Pauline Gower, a circus pilot and daughter of a British parliamentarian, was ideally suited for the job. She was well connected and more than capable of confronting the resistance mounted by male opponents to the concept of women pilots. Necessity prevailed: Gower was hired and asked to recruit eight more women in January 1940. Eventually, 168 women out of nearly 1,500 pilots from 28 countries would fly for the ATA. They became known as “attagirls,” and Jaye Edwards was one of them. 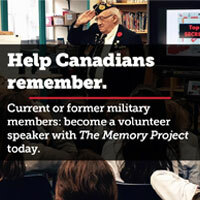 They flew everything from Spitfires and Hurricanes to Lancasters and Fortresses. Fifteen attagirls died on duty, including the British pioneer Amy Johnson and several of Edwards’ colleagues. Two attagirls were awarded commendations. Edwards joined the ATA in 1943. She said it was “just the fascination of getting off the ground” that attracted her to flying. At the time, in the throes of war when everyone did their part, she didn’t feel like a trailblazer. Pioneers like Batten, Johnson, American Amelia Earhart and others had forged a path for women in aviation during the 1930s. They flew by the seat of their pants, usually alone using maps with no names, taking to the skies in all weather, often in planes they had never flown before and always without radio communication. 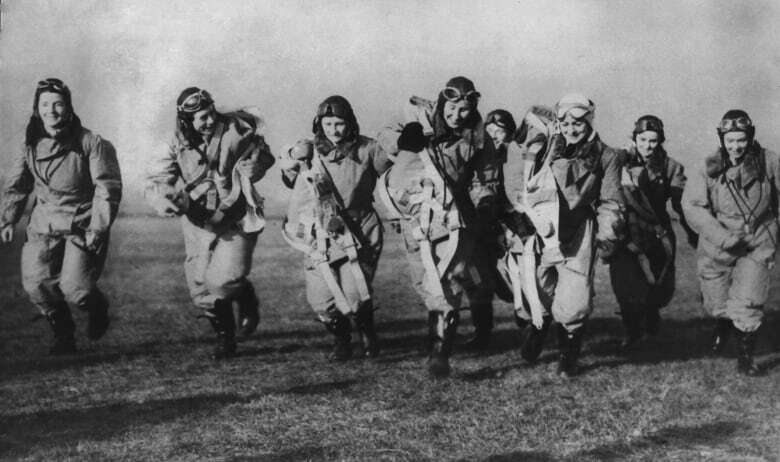 The first delivery by the female ATA pilots during the war was on Jan. 10, 1940. The choice of whether to fly was always theirs. There was no shortage of airfields in 1940s Britain on which they could land if the weather turned particularly sour. And the women, who drew a significant amount of attention, were always welcome. Alternatively, Edwards would give her plane a little more throttle, a little rudder, and execute a climbing turn until she emerged from a storm into clear blue sky. The ATA pilots would rarely get checked out on a new aircraft type before departure. Most often, they would strap an abbreviated manual to their thigh and learn on the fly, literally. “If you’d never flown the plane before, you would ask for that extra booklet,” she said. “They had a booklet on every plane that we might have to fly. Entrepreneur and warbird pilot Michael Potter does a flypast in the Vintage Wings of Canada Spitfire for former Air Transport Auxiliary pilot Jaye Edwards. She flew 20 different aircraft types, amassing hundreds of hours over the course of hundreds of sorties. Her favourite planes were three well-known fighters: the Hawker Hurricane, the Supermarine Spitfire and the Boulton Paul Defiant. She flew the Fairey Barracuda (a navy torpedo- and dive-bomber) and the Supermarine Seafire (the navy version of the Spitfire). The biggest she flew were three twin-engined aircraft: the Avro Anson, the Airspeed Oxford and an ungainly looking biplane, the de Havilland Dominie, an eight-passenger light transport she described as the “most different” of the lot. 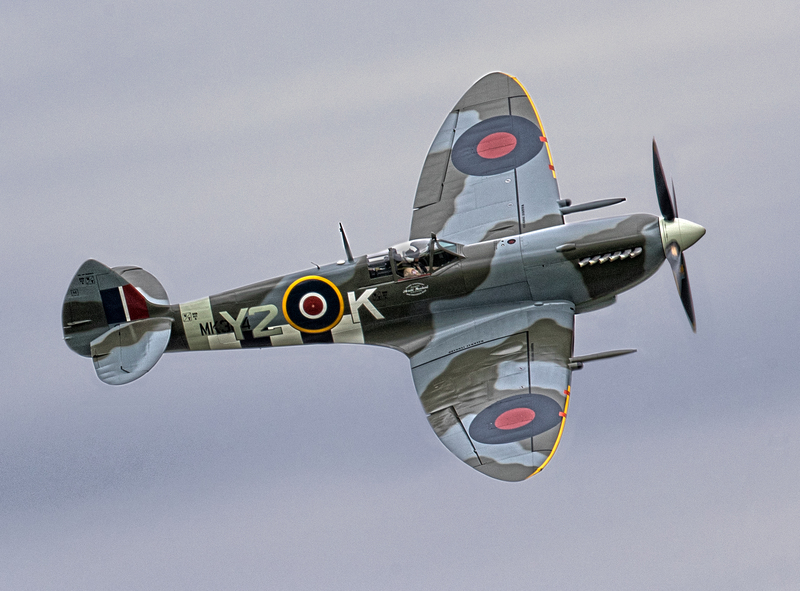 Many a Second World War pilot and more have waxed poetic about the Spitfire. Not Edwards. “Well, to be honest, they were planes,” she says matter-of-factly. “I looked upon them as something you were given to fly and all planes are built to fly, whether you want to do anything to them or not. She did not have the time, inclination or stomach for aerobatics or experimentation. Her priority was getting the planes from A to B in one piece. 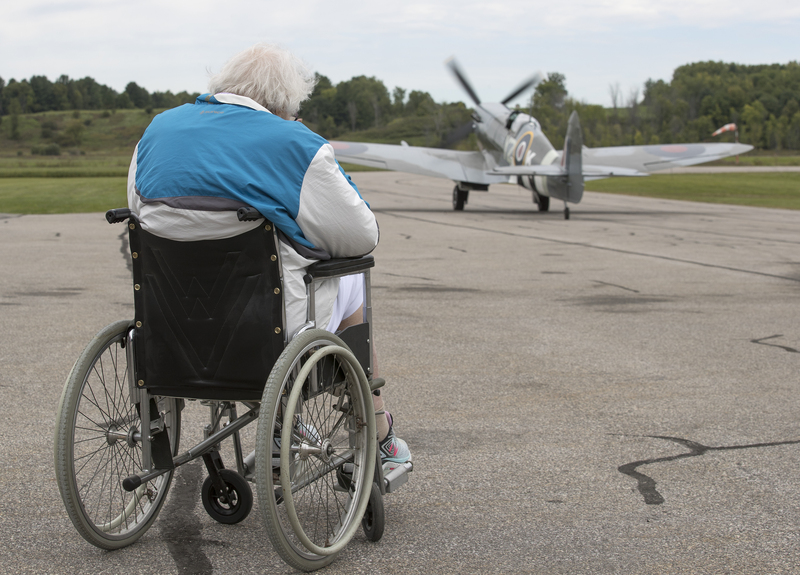 Former Air Transport Auxiliary pilot Jaye Edwards watches the Vintage Wings of Canada Spitfire taxi for takeoff. The attagirls were initially paid 20 per cent less than their male counterparts, but by 1943, they had won the same pay as men of equal status in the ATA. It was the first time the British government granted equal pay for work of equal value in one of its organizations, ATA pilot Lettice Curtis reported in her book The Forgotten Pilots. Women flying as U.S. Women Airforce Service Pilots (WASPs) were receiving as little as 65 per cent of the pay given their male colleagues at the time. ATA pilots had transported 309,011 aircraft by the time the war ended and the organization was disbanded. Edwards’ exit debrief stated she was a better pilot than she thought she was—an assessment she says could have applied to just about anything she did in life. Postwar, she went back into childcare, accompanying a friend and her family to the South Pacific. She travelled the world, worked as a secretary in Singapore and ended up in British Columbia, where she met her husband, had a family and took up teaching. She did not fly again until she was in her 80s, when she took the stick of a small plane over White Rock, B.C., executing a perfect turn, emerging straight and level exactly where she wanted. She said her experience as an ATA pilot made her more independent, allowing her to find her own way, absent the influences of family and older siblings. Fascinating story. I’ve always admired those women pilots of ATA and WASP. My grandfather was friends with an ATA lady – Diana Barnato-Walker was her married name. I wish that I knew then what I know now so I could have learnt more from her. Another hero just doing the job! Count the pieces, kick the tires, light the fires. I will always envy you and that type of flying. Thank you for the service and the story.